Graeme Shinnie will lead Aberdeen into today's Betfred Cup semi-final against Rangers. Being up against it in cup semi-finals is nothing new to Aberdeen skipper Graeme Shinnie. As a Caley Thistle player, he was twice involved in unforgettable victories, over Hearts in 2014 and Celtic in 2015, that netted the Highlanders major final appearances. The Hearts one came a year after they had exited the same competition – the League Cup – at the same stage to the same opponent. This victory came against all odds, with the game played at noon in Edinburgh, with the Caley Jags going 2-1 down and down to nine men. Obituaries were already written. He said: “That was one of the best games I’ve probably ever played in. We were down to nine men. I think Josh (Meekings) got sent off late on and it looked like that was it. We got a late goal from Nick Ross and it galvanised us a wee bit and in extra time it was 11-versus-nine. It was one–way traffic; we just got battered. Josh’s sending off was a kick out but Gary Warren’s was a bit harsh when he got sent off. “It was one of those that when we got into extra time it was backs against the wall and doing everything we can. We wanted penalties because we were down to nine men. Both semis went to pens. In the first one I scored and we went out and in the second one I missed and we went through. Cup football is mad. That game was mad. The Celtic game had Josh’s handball. It’s the brilliance of cup football. 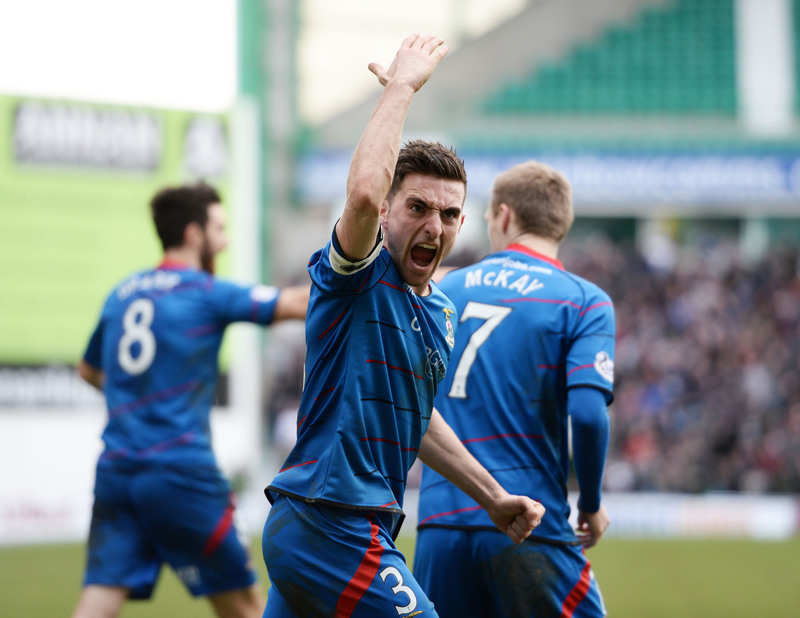 Graeme Shinnie celebrates Nick Ross’s goal in Caley Thistle’s League Cup semi-final win over Hearts four years ago. With the manner of their progress, the final against Aberdeen proved somewhat of an anti-climax. The final, held at Parkhead, again went to penalties, with the Dons triumphing. Lessons will be learned from that game for Shinnie heading into this afternoon’s last-four contest with Rangers. The occasion is there to be seized. He added: “It was pretty much an away game for us. We went to the final at Celtic Park against Aberdeen and they had about 50,000 and we had about eight or 10 thousand. The cup final wasn’t a great spectacle. It was one of those games that no one really wanted to go ahead and win it. “I felt both teams were jittery that day. I felt like nobody was really taking full advantage of it and nobody was willing to go out and do something with it. We were both sitting back, not wanting to concede a goal. It wasn’t great to play in but cup games can be like that. “With Aberdeen winning it that day and the massive celebrations that they had means nothing. In cup games it doesn’t matter how the game goes. Rangers could batter us for the whole game and if we score in the last minute and go through, nobody really cares. It’s cup football, it’s all about getting through. Every game is different and you have to just deal with it on the day.